Now that the two-month long thing called the NHL Playoffs is out of the way, we can all concentrate on the real fun stuff: the off season! (If you are an F-1 fan, the "silly season). First, (June 18) the NHL awards. Does Tim Thomas win the Vezina? Nicklas Lidstrom the Norris? Do they just name a new trophy "the Lidstrom", because he should win every year? Does the Calder go to Bobby Ryan or Steve Mason? Is the Selke a given for Pavel Datsyuk? Are the names of the trophies a complete mystery to anyone who doesn't live for hockey? The MVP: Ovi, Malkin or Datsyuk? Personally, I don't care... I am no fan of awards that are given by opinion. The Art Ross, the Rocket Richard, the Jennings and of course, Lord Stanley's Cup are all earned... no guessing involved! I'll save you the trouble by telling you that the Red Wings will pick some kid in the 200's that will be better than everyone else! However, the party begins July 1 when free agency opens! Heading the list of free agents again will be Marian Hossa! I have heard that he has already been offered a long-term deal by Detroit. But whether he signs or decides to explore his options with other teams with much more cap room will be of great interest! Certainly Toronto, Los Angeles, Atlanta, Florida, Vancouver, Edmonton and the NY Islanders will be very active in the market and will set the bar on this year's big dollar guys such as Hossa, the Sedin twins, the other, maybe even better Marian, Gaborik, Martin Havlat, Jay Bouwmeester and others end up! Not to be outdone, a new story developed this week: Dany Heatley has had enough of another town and wants to leave Ottawa. 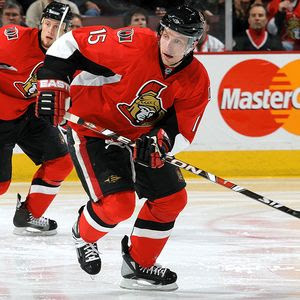 Hockeubuzz.com broke a story this afternoon that a potential 3-way (ha,ha) trade could be in the works involving Ottawa, Los Angeles and Tampa Bay sending Heatley to L.A., Vinny Lecavalier to the Senators and Jack Johnson and a boat load of draft picks and prospects to the 'Ning! All of these stories are sure to develop and we will talk about the awards, the draft and all the off-season movement as the week goes on. In the mean time, let me know what you hear! As I am writing this, I am texting my Detroit "contact" on what is going to happen there! Stay tuned! Dany Heatley to the Kings is such a spectacularly bad idea, it has to be a given. Like, horrendously bad for all involved.